Thanks to the tremendous work of the on-site construction team, North Somerset’s new business development centre – The Hive – is fast taking shape. The Hive, which is being built for North Somerset Enterprise Agency, will deliver an array of on-site business support, resources and services as well as the flexible office space that North Somerset’s start-up, small and growing businesses need, all under one roof. 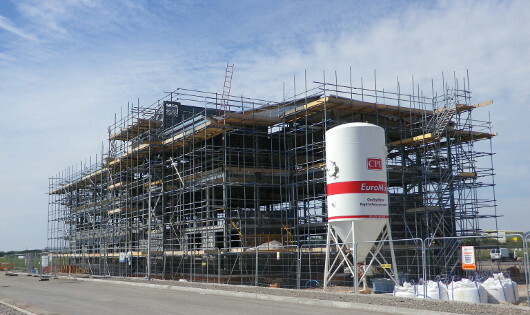 The floors and stairs of the impressive three-storey building, based in the Junction 21 Enterprise area of Weston-super-Mare, are in, the walls are being built and the roof is being put in place. September will see the ‘topping out’ as the roof reaches its’ highest point, marking a real milestone in the building of The Hive, which will be ready to welcome its first tenants from Spring 2014. A preview evening is being planned for November by North Somerset Enterprise Agency to enable local businesses to find out more about what will be on offer to them – from professional, flexible and affordable workspace including fully-equipped offices with short-term easy-in, easy-out leases to the high speed broadband and managed business reception. For local businesses who don’t yet need permanent space, virtual offices and meeting rooms will also be available. “The Hive is the dedicated business centre that North Somerset asked for and helped to establish and we are proud to deliver it.” says Angela Hicks, Chief Executive of North Somerset Enterprise Agency. “We’ve long wanted to offer a complete package of workspace and support to help local businesses succeed and grow and The Hive will be where it all comes together. More information about The Hive in North Somerset is available by calling Angela Hicks on 01934 418118 or emailing: angela.hicks@nsea.biz.